How’d you get your start in cycling? I loved cycling as a kid. I remember when I was 12 or so, I dreamed of riding the Tour de France some day. Later when I moved to the U.S., I started racing on the road. The University of Texas where I was going to school had a team, so it was very easy to join. That was in 1989. What was the U.S. road racing scene like in 1989? Lemond had just won the Tour de France by eight seconds, and he had been Sportsman of the Year for Sports Illustrated, so a lot of people were aware of cycling. But most of the cyclists were still vegetarians and hippies, you know, the alternative crowd. You had plenty of them in Austin, TX. It was different than it is today, for sure. How serious were you about racing bikes and training? It was a hobby. Obviously, you want to win when you’re racing. That’s the reason to do it, at least for me. But I was pursuing my studies mostly. It was never something I thought I would want to do full time. In Europe, it was difficult to even get into racing. It wasn’t really something a student would do on the side. People were racing because they were hoping to become professional. It was a much more serious pursuit. There was also a class difference between the racers and university students. They didn’t mix as easily. When did you start randonneuring? I’d always loved riding long distances. Even when I lived in Germany, I would visit my father for his birthday or friends all over Germany, riding 100 miles one way, then 100 miles back the next day. I’d always wondered what’s beyond the next hill. When I was in Texas, I visited a friend for Thanksgiving in Dallas. I rode 200 miles in one day. I thought that was the furthest anyone had ever ridden. When I found out about randonneuring, it was pretty natural to get involved. 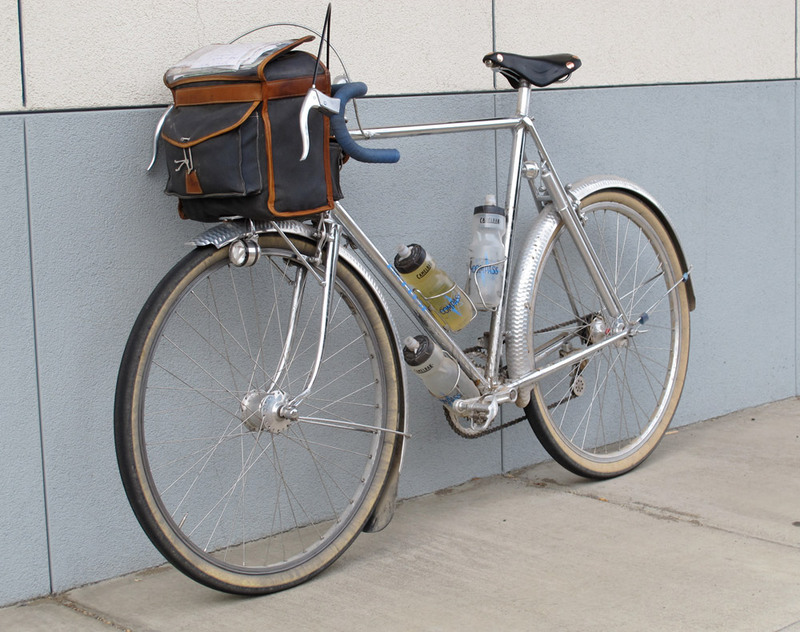 Jan Heine’s Rene Herse. Photo courtesy Jan Heine. How did you find out about it? I’d imagine it was even more difficult to find back then. It was in the early 90s, I was working on my PhD at the University of Washington. The Internet was in its infancy, and there were some discussion groups. Somebody from Seattle asked about a Mercian bike, and I replied that I had one. We met so he could look at it before ordering his own from Britain. He was involved with the randonneurs. Back then the cycling community was smaller. If there was a randonneuring group in your part of the world, you’d hear about them. Other than there being many more people doing it these days, was randonneuring a very different scene 20 years ago? It wasn’t so much a sport on its own yet. A lot of people considered it training for Race Across America or qualifying for Paris Brest Paris. RUSA (Randonneurs USA) has done a really great job of making it actually a goal on its own, rather than just preparation for other events. What’s the appeal of long-distance cycling? A few things. First of all it gets you out to places you don’t normally go. I live in the big city of Seattle. If I ride 20 miles, I’m not going to get out of the suburbs. But if I ride 100 miles, I can go to amazing places in the mountains with beautiful views. If I go for 600km in a brevet, I can get all the way to the other side of the mountains into a totally different climate. Then there’s the sense of achievement. You look at the map and say “Wow I’ve ridden from here to there!” And finally, I enjoy riding my bike, so I’m always sad when the ride is over. Thus going longer makes sense, within reason. I don’t think I would necessarily enjoy going for days and days on end. But anything up to 1,000 km can be pretty enjoyable. So you don’t have any interest in something like the Great Divide race or Race Across America? I’m fascinated by the Great Divide race, but for me, it would be hard to A) find the time and B) stay motivated for that long. Race Across America is too focused on the athletic aspect alone for my taste, with support crews. To me that takes away a little bit from the independence of cycling, and the feeling that I can go anywhere, powered only by my own legs. That is also the reason why I prefer rides that start at my back door. You’ve built a reputation for pulling off impressive feats of cycling endurance. Which of your past rides or adventures stand out as your favorites? Oh gosh. There’s so many. Every ride’s a favorite. Often it’s not the ones that really grab the headlines, but just heading out with friends into the Cascades. There was the Cyclos Montagnards ride where we made a goal of riding to the highest places on Mount St. Helens and Mt. Rainier and back to Seattle in 24 hours. That was a pretty awesome ride. Just three of us working together as a team and making it back with 21 minutes to spare. We started and stopped at the same cafe and the same barista was working. We had our cards signed when we left. When we came back 24 hours later, the guy asked, “You? Did you ride your bike the whole time?” We said yes we did. That was really funny. It was a very special ride. We got to the top of Windy Ridge on Mt. St. Helens just as the sun was rising. The crater of the volcano was bathed in orange morning light. Then we turned around to ride towards Rainier, and we saw all the other volcanoes: Rainier and Mt. Adams and Mt. Hood in just one view in front of us in the morning light. That was just amazing. And we hadn’t seen a single car in six or seven hours riding up there. That’s something you just don’t get on a Sunday morning ride. You don’t get that sense of adventure and achievement of being out there in the middle of nowhere. 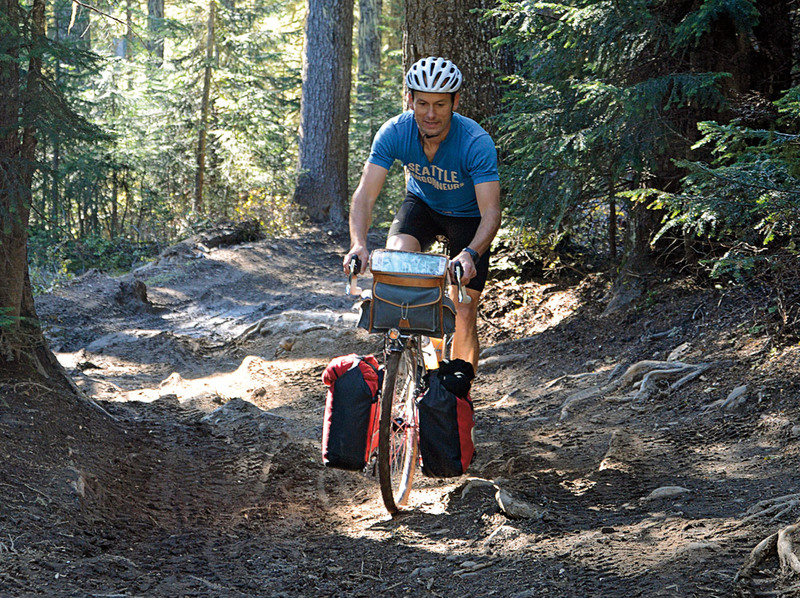 Last summer I did a backroad gravel tour from Portland to Seattle through Gifford Pinchot. I think we probably hit some of the same roads as your Three Volcanoes brevet. It was amazing to go most of a day without seeing another person, let alone a car. Exactly. I really enjoy that. That’s a beautiful area. I am glad you got to experience it. 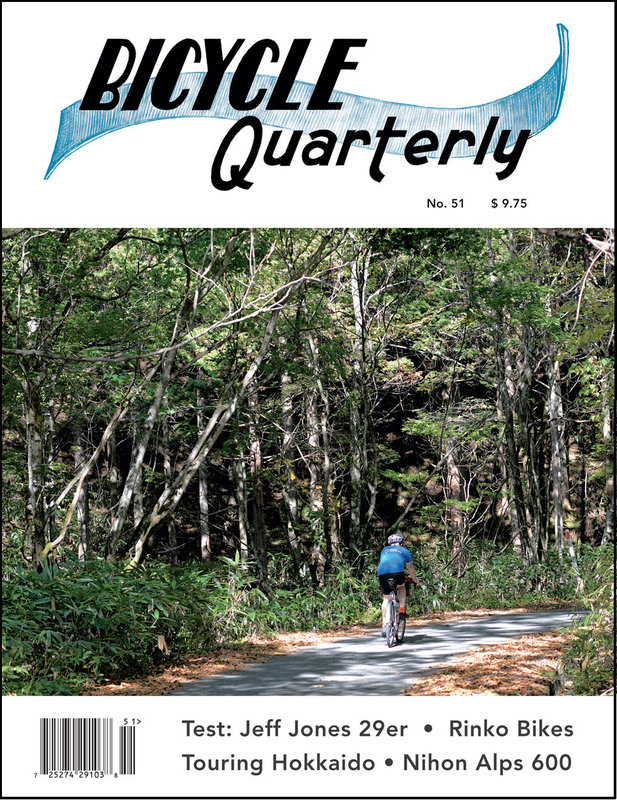 What inspired you to start Bicycle Quarterly? I had been writing for various magazines, most of which vanished such as Bicycle Trader and On The Wheel. I had collected stories and interviewed people because I was really interested in the French randonneurs. I had talked to some truly amazing people. But there was nowhere I could publish these stories. I decided to start a little newsletter just for friends. Then Grant Petersen put a note in the Rivendell Reader that I was doing this, and before I had even put the fist word to paper, I had more than 150 subscribers. I realized I had to do something better, so I started a magazine. It just grew over time. We’ve done it for over 13 years now, and we’ve got over 4,000 subscribers. It started as a hobby, and now it’s a full time job. Tell me about your other company Compass Bicycles. Compass Bicycles is a logical outgrowth of Bicycle Quarterly. We had found all this wonderful stuff that either nobody was selling in this country, or nobody was making at all. We said, we know how to make better tires or how to make a great centerpull brake. I suggested it to some other makers and some of them made parts, but of course they made the parts they wanted to make rather than the parts I wanted to make. Rather than telling people how to run their businesses, I decided to start my own. At first, it was just books like some French books you couldn’t find here that we ordered for our readers and so on. When we started selling tires, we decided it didn’t make sense to buy tires from a bike magazine, so we started Compass. We make the parts that we found in our research to work best and the parts we want to ride on our own bikes. Has it been difficult keeping a subscriber-driven publication afloat all these years? No, not at all. We have very loyal readers. Since the readers know it’s them who support the publication, that they’re not just bodies we present to our advertisers, they’re very loyal. They spread the word. It’s been amazing to me how much the publication has grown over time and how enthusiastic people are. We have a lot of people who have subscribed from the first day and are still there, or have bought all the back issues and still await every issue eagerly. It’s wonderful to hear from them. One of the things you’ve really prided yourself is trying to be an objective voice about products and testing, drawing on your science background. We do try to be a credible source. We once wrote in Bicycle Quarterly that a tire we made years ago wasn’t worth the money. Compass sat on those tires for years until we closed them out because everyone had read, well they’re not worth the money. To us, it’s more important that we maintain that credibility than that we sell a few tires. People have realized over time that’s how we operate and we’ve become a trusted resource. That’s really valuable to us. I think maybe the rest of the media would do well to consider that a little more. But it’s hard, you know, if you have advertisers breathing down your neck. We’ve lost a few advertisers when we didn’t like their products. It’s easy to criticize our own products because we only have to deal with ourselves. It’s a little harder if we criticize products made by friends or advertisers, but even then there’s nothing we can do about it. In my view, it’s up to the companies to improve their stuff. Grand Bois tires were introduced just as we started to test tires. We were importing them. We found them to be good, but not as good as they could be. Grand Bois and Panaracer said, “OK, let’s work together and make them better.” A wonderful cooperation started, and the latest result, after many iterations, are our Compass tires. That is the best possible outcome. As a rider, I want better tires more than anything. The sales will follow from that. A big criticism of the broader cycling media landscape is that there’s no objectivity and it’s driven by advertising and the industry. Are there other publications out there you think are producing good, objective cycling media? You know, it’s interesting you say objective. Objective sounds like a theoretical approach, but that doesn’t always work well, since the human body, which is the most important part of the bike, is so complex. The important part for Bicycle Quarterly is we start with the riding experience. What is it like to ride this bike? Why is one bike different from another? We ride all these bikes and find this one corners differently and that one does that differently. Then we try to explain why that is. Fortunately, as scientists, we have the tools at our disposal to do tests, see trends, isolate factors, and ultimately try to figure out what’s going on. You need to start with the riding experience because otherwise, you inevitably simplify and you get stuff like, “stiffer frames must be faster” or you test tires on steel drums where the suspension losses are overlooked. The bike media are in a tough spot. They all rely on advertising from companies, most of which don’t have much money. The advertisers who do have money like to throw their weight around. I think it’s really, really hard for the magazines. We’re really lucky that our independence — I don’t want to say objectivity — is our biggest asset. So even though there’s a conflict of interest when we sell bike parts through Compass, people know that we are our harshest critics. Do you have any riding goals left? There are always new things I’d like to try. There are some wonderful courses being designed all over the world. Last year was the first-ever Oregon Outback, and that was a lot of fun. Even revisiting stuff we’ve done before can be interesting. You can always try to go faster or finish stronger or experience the course during a different season. I don’t see myself getting bored anytime soon. I’m not that keen on organized rides anymore. I mostly just like going out with friends. That said, Paris Brest Paris is always an incredible experience. I plan to be back this year. Some of the Super Randonnee 600 rides look really interesting, too. Then there are just lots of places I’d love to visit. Like the Andes of South America. I’ve experienced a little bit of it, but there’s some spectacular riding there. And this country has so many great roads that we’ve only barely scratched the surface. Looking down the road, what do you hope to have accomplished with your work through BQ, Compass Cycles? Mostly I want to inspire people to experience the beauty that we experience on our bikes and on our rides. It’s a wonderful thing. Like you were saying, you’re going on backroads, and you don’t see any cars. That is great. But you also don’t see any cyclists. It’s not like I want to see a cyclist every five minutes, but the fact that you were probably the first cyclist to come through all week makes me a little sad. Portland has thousands of cyclists. Seattle has thousands of cyclists. Most of them never get to see this. My biggest goal is to inspire people to go out there and realize, “I can do this. It’s safe. It’s fun.” And I think it’s working. You see all this growth in gravel riding and things like that. A lot of things that we’ve championed for a long time are catching on now, and that’s a really good thing. Ultimately, we shouldn’t divide the bicycle world into racers and non-racers and this and that. In the end, we all share the joy of cycling. It can come in so many different guises. If I see someone who’s riding their bike with a smile, I don’t care whether they’re on a WalMart cruiser or carbon racing bike or 650B randonneur bike. I want to inspire people and not tell them what to do or not to do. This entry was posted in Cycling Media, Interviews, Randonneuring and tagged 650b, bicycle quarterly, compass bicycles, cycling media, french constructeurs, French golden age of bicycles, jan heine, randonneuring, rene herse, RUSA, seattle randonneurs, ultra endurance cycling. Bookmark the permalink. Wow. Thank you for sharing this interview! It is very motivating to hear from someone that has had such success because of his hard work. Cycling changed my life ever since I needed to get in shape. It was more than exercise, it is a balm for emotional pain and struggles and a beautiful way to see the world. My family all got involved and we now attend all of the cycling events and races that we can.